Europe’s Automated Transfer Vehicle-3 (ATV-3) spacecraft is all set to deliver a large load of cargo to the International Space Station (ISS), providing a welcome boost of crew supplies, replacement hardware and scientific equipment aboard the orbital outpost following last year’s retirement of the Space Shuttle and launch failure of a Russian Progress spacecraft. ATV-3 is currently awaiting launch at the Kourou Space Center in French Guiana, following a launch delay due to a loose cargo strap. Originally set for launch on 9th March, for a docking to the ISS ten days later on 19th March, the launch was delayed last week when mission managers took the decision to correct the loose strap issue following a review of pre-flight close-out photos. Since the decision to correct the issue was taken after technicians had sealed ATV-3’s hatch and lowered the fairing of the Ariane V launch vehicle over the spacecraft, the launch delay is due to the fact that the fairing now has to be removed, the Late Cargo Access Means (LCAM) erected, the ATV-3 hatch re-opened, the strap issue corrected, and then the ATV-3 hatch re-closed, the ATV-3 internal atmosphere flushed with ultra clean air, the LCAM disassembled, and finally the fairing re-installed. ESA yesterday officially confirmed that ATV-3 is now targeting a launch on Friday 23rd March at 4:31 AM GMT, with an accelerated docking likely to be five days later on Wednesday 28th March at 10:51 PM GMT. Undocking and re-entry would likely occur sometime in September. The docking, accelerated to five days after launch instead of ten days after launch as previously planned, is because ATV-3 was previously planned to enter into a parking orbit for five days following a 9th March launch due to thermal constraints. However, a 23rd March launch does not carry such thermal constraints, allowing ATV-3 to proceed immediately into the rendezvous phase. Following the retirement of the Space Shuttles last year, the ATVs are now the vehicles with the largest cargo-carrying capacity for the ISS, via ATV’s Integrated Cargo Carrier (ICC) for transporting “dry cargo” (i.e., internal items), and the Service Module (SM) for carrying “wet cargo” (i.e. propellants). The ATV SM carries propellants to be used for its own rendezvous and docking with the ISS, reboosts of the ISS during the ATV docked phase, and for transfer to the ISS’ own propellant tanks. During the ATV-2 mission in 2011, four “big boosts” of the ISS were performed by the ATV-2 SM to raise the altitude of the ISS by 30 km, to around 400 km, in order to decrease the requirements for reboosts in the post-Shuttle era due to lesser atmospheric drag at higher altitudes. Due to this decreased requirement for propellants, and thus increased capacity for dry cargo, numerous modifications were planned for the ATV ICCs from ATV-3 onwards, including the addition of Enhanced Integrated Stowage Platforms (EISPs), an Aft Carrier Plate (ACP) and Aft Cargo Frames (ACFs) to stow cargo on the aft endcone of the ICC, and stowing cargo in the rack standoff support structures. However, as explained by an ESA ATV engineer in a Q&A with NASASpaceflight.com (available in full on L2), such modifications are now no longer planned. However, even without the aforementioned modifications, ATV-3 is still set to deliver the largest ever load of dry cargo to the ISS than any of the two previous ATV missions, via the use of eight Integrated Light Racks (ILRs) instead of the six used in previous ATV missions. 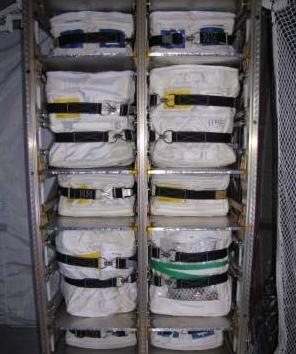 Although ATVs can carry a total of eight racks, only six have ever been used in the past, with soft Temporary Stowage Racks (TSRs) being deployed in the two empty rack locations (Forward-Overhead and Forward-Deck) by the ISS crew once ATV was docked to the station. However, as explained by an ESA ATV engineer to NASASpaceflight.com, it was decided that flying with eight ILRs was the best option. “Since the propellant load on ATV-3 was much higher than expected, the best configuration for dry cargo was an eight ILR rack configuration. This was not a design modification, but simply the full use of the available ATV pressurized volume, which was not required for ATV-1 and -2”. The use of eight ILRs will feature on future ATV missions as well, as explained by an ESA ATV engineer. “The propellant need for ATV-4 is such that it makes more sense to fly eight ILRs and not the [modification] items mentioned above. However, for ATV-4, we will have the new LCAM (Late Cargo Access Means), which will allow us to load triple-size CTBs (Cargo Transfer Bags) with a mass of up to 75 kg”. “These triple CTBs could be loaded both inside a rack sector and on an adapter plate. Never before have we loaded adapter plates during late load operations in Kourou, nor have we handled CTBs with such a high mass. The late cargo is normally restricted to double size CTBs with a max mass of 25 kg”. As previously mentioned, ATV-3 will carry the largest load of dry cargo to the ISS than any previous ATV mission, with ATV-1 in 2008 carrying 1150 kg of dry cargo, ATV-2 in 2011 carrying 1605 kg of dry cargo, and ATV-3 set to carry a massive 2201 kg of dry cargo. Among the more notable items flying inside ATV-3 is the Fluids Control Pump Assembly (FCPA), used to recycle urine into drinkable water aboard the ISS. This is considered a critical item since no spare FCPA currently exists aboard the ISS, thus presenting an issue should the operational FCPA experience a failure. Due to its size and time constraints, loading the FCPA into the ATV-3 ICC was a challenge, as detailed in the ESA ATV-3 blog. 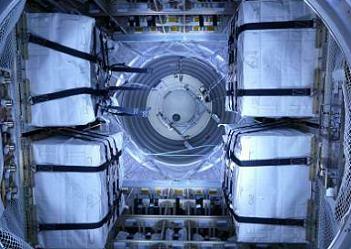 Among notable scientific items flying aboard ATV-3 are NanoRacks Modules 16 and 18, and the PIG in a Blanket hardware for the Human Research Facility (HRF) rack in ESA’s Columbus module, which will be used to supply calibration gas for the HRF VO2max experiment. Following on from their two flights in 2011, one successfully inside Japan’s H-II Transfer Vehicle-2 (HTV-2), and the other unsuccessfully inside ESA’s ATV-2, the Re-Entry Breakup Recorder (REBR) will make a third flight aboard ATV-3. 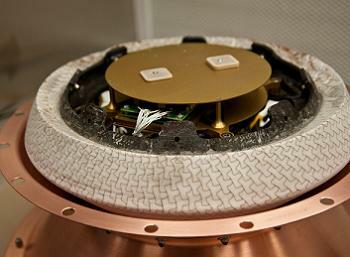 REBRs are designed to record data about spacecraft disintegrations during atmospheric re-entry to improve models of how such break-ups occur. The ATV-3 SM will carry fewer propellants than the ATV-2 SM, due to the fact that ATV-3 will not need to perform any “big boosts” of the ISS, although ATV-3 will still provide propulsive support for all reboosts and Debris Avoidance Maneuvers (DAMs) during its docked mission. ATV-3 mission propellant, i.e. 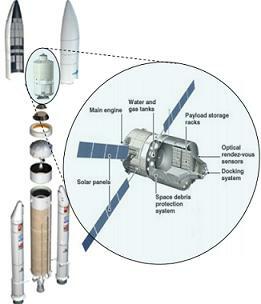 propellant ATV-3 will use to rendezvous and dock with the ISS, will actually increase over ATV-2 mission propellant, with ATV-3 carrying 2261 kg, while ATV-2 carried 2030 kg. ATV-1 however carried 3598 kg of mission propellant. ATV-3 ISS propulsive support propellant, i.e. propellant for ISS reboosts and DAMs, will be 3150 kg. ATV-2 carried 4530 kg of ISS propulsive support propellant, while ATV-1 carried 2260 kg. Refuel propellant, i.e. propellant for transfer to the ISS’ tanks, will be the maximum load of 860 kg on ATV-3, while ATV-2 carried 850.6 kg, and ATV-1 carried 860 kg. 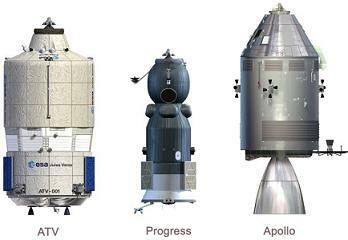 In total, the ATV-3 wet cargo load will be 4395 kg, while ATV-2 carried 5486 kg, and ATV-1 carried 3407 kg. When coupled with the ICC dry cargo loads (2201 kg for ATV-3, 1605 kg for ATV-2, and 1150 kg for ATV-1), that will give a total combined cargo load of 6596 kg for ATV-3, with ATV-2 having carried 7091 kg, and ATV-1 having carried 4557 kg. This means that, despite fulfilling all ISS propulsion requirements and delivering 600kg more dry cargo than ATV-2, ATV-3 will actually weigh almost 500kg less than ATV-2. With the Space Shuttles retired and the ISS now reliant upon international and commercial resupply capabilities, Europe’s workhorse ATVs will continue to support the ISS through to ATV-5 in 2014, with ESA member states and the ISS international partners currently in discussion about leveraging the hard-worn legacy of the ATV to build a follow-on vehicle to pay ESA’s dues to the ISS program in the post-2015 timeframe – which could include a Service Module for the Multi Purpose Crew Vehicle (MPCV) Orion. Regardless of any follow on vehicles, the role of the ATVs and their dedicated support teams will continue to be vital to the ISS in the years ahead – a role that has so far been performed with professionalism, dedication, and passion. 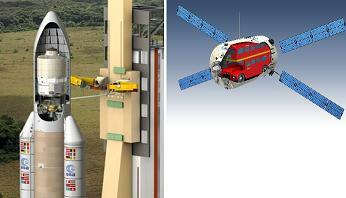 Please follow ESA’s ATV blog for a behind the scenes look at ATV-3 mission preparations.